As a kid, the month of December was twice as nice for Alex DeBrincat. As an NHL player, he’s hoping for the same, only in April. Opening presents during the last month on the calendar has always been doubly fun for the 20-year-old from Michigan, whose birthday happens to fall one week before Christmas day. Not surprisingly, hockey-themed gifts were the norm in the DeBrincat house. The man who looked up to Detroit Red Wings legend Pavel Datsyuk certainly put his presents to good use. After suiting up with Lake Forest Academy in Illinois, DeBrincat played three seasons with the Ontario Hockey League’s Erie Otters. He lit the lamp in his first OHL game and completed his first campaign, in 2014-15, with 104 points (51 goals, 53 assists) in just 68 games. At the 2016 IIHF World Junior championship, DeBrincat scored an important goal in the quarterfinals to help the United States take the gold medal. 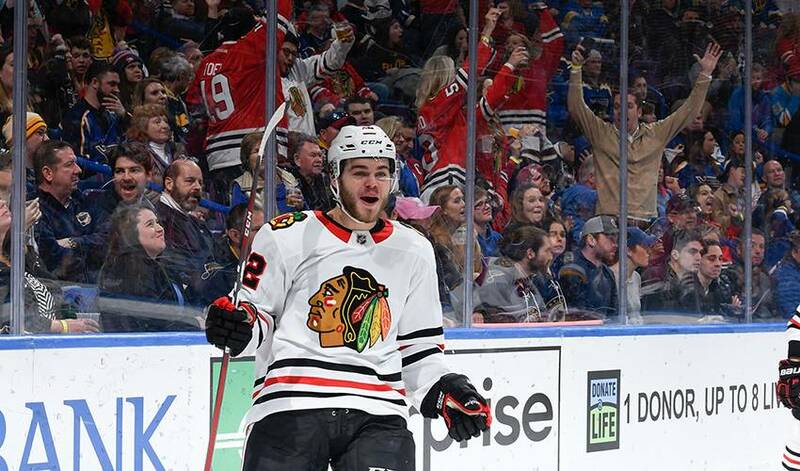 After a second straight 51-goal season, the Chicago Blackhawks selected DeBrincat in the second round (No. 39) in the 2016 NHL Draft. In his third and final campaign with the Otters, he led the league with 65 goals, along with 127 points and a plus-60 rating in 63 games, en route to Red Tilson trophy honours as the OHL’s most outstanding player. The right wing scored his first NHL goal on Oct. 10, 2017, against the Montreal Canadiens and became the second-youngest player in Blackhawks history to net a hat trick, a feat he achieved against Anaheim on Nov. 27, 2017. Playing in all 82 games, DeBrincat tallied 28 goals and recorded 52 points in his NHL rookie season. Which is just how he felt when he suited up for his very first NHL game, one that happened to come against the Sidney Crosby-led Pittsburgh Penguins. And that’s what DeBrincat, who finished seventh in voting for the Lady Byng Trophy, did throughout that 2017-18 season. The only negative was missing out on his first NHL playoffs experience. DeBrincat’s hoping he’ll get that chance come April.